Every action that you do in ChefVille requires at least 1 Energy. These actions range from collecting ingredients to cooking to serving customers. You can see how much Energy you have left by looking at the energy bar in top right corner of your screen. #1. Visiting ChefVille Friends- You can visit friends by clicking on their picture at the bottom of your screen. 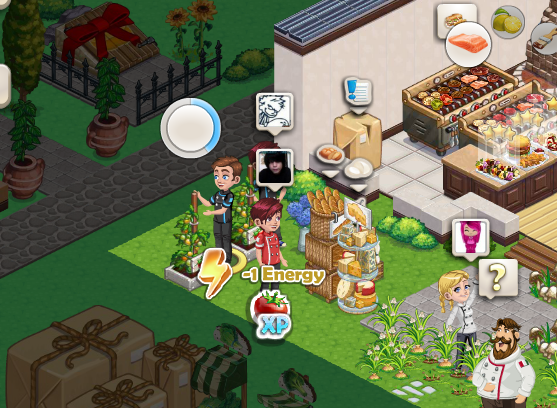 You will receive 3 energy when you visit your neighbor for the first time and 1 energy thereafter. You can do this for a maximum of 25 Energy every 24 hours. #3. Energy Pack (+1 Energy)- Friends can gift you with energy packs. When you visit and help a friend's restaurant they can accept your help and then have an option to send you an energy pack.You can use these Energy Packs in your inventory. #4. 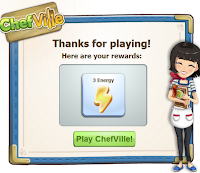 Friends Can Share Energy- After completing quests, ChefVille players will have the option to share free energy on their Facebook wall. 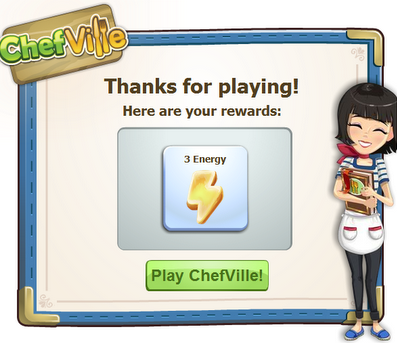 Check the Facebook walls of your ChefVille friends to get some free energy. #5. Leveling Up- Getting enough XP will allow you to gain a level. Each Level Up gives you full energy and increases the maximum amount of energy you can hold. #6. Buying Energy- As a last resort, you have the option of buying energy when you run out of it. This will require Cash then you can buy with real money. I hope these tips helped. If there are any other ways of getting energy please comment below. Thanks for reading!